Today's fun lesson: even moms of the mostly hermit-invalid variety are not (always) spared from the wrath that is Monday bleeping morning. I'll just cut to the chase. I think the high point came as I pulled on my martyr uniform, rolled my eyes, switched to mouth breathing and started to clean up one of Julia's pathetic potty 'misses' that magically wound up allllllllllllllll over the first floor and the entirety of the bottom half of her body (not urine). As she machine gun narrated, that it was gross and stinky ("dose!!!! sinky!!!!!!") in case I was not fully aware that I had lucked into the most pungent and delightful situation that 7:35am had to offer, I couldn't help but do the unthinkably awful and add some momit (mom+vomit) to the mix. This made clean up all the more enjoyable as Julia watched in horror while simultaneously feigning the face of perfect innocence. I would imagine she'll be seeking absolution for the rest of the day after she saw the storm cloud of bad mood hover and perch itself over my head for the next zillion minutes. ... and helped himself to a fortifying breakfast of Simon's nary-a-blossom-in-sight tomato plant's carefully and lovingly tilled soil. Don't tell Dad -- or the babysitter just might be (very) dead. When I was a wee one, my mother liked to tie a giant scarf around her face/nose when she cleaned up my less than pleasant surprises, haha. Hahahahahaha!!! That picture of Sebastian is priceless!!! Um... after your description of your Monday morning, I will happily return to my morning of staring at paper, pretending to work while I secretly will the seconds to click by. Cheers to our sanctifying vocation- he he he. Ok, this cracks me up because I just seconds ago blogged about blessed Monday as well. However, mine only involved flooding of the first floor with water, so I'll take that over poop any day! Hope the rest of your day goes better!! 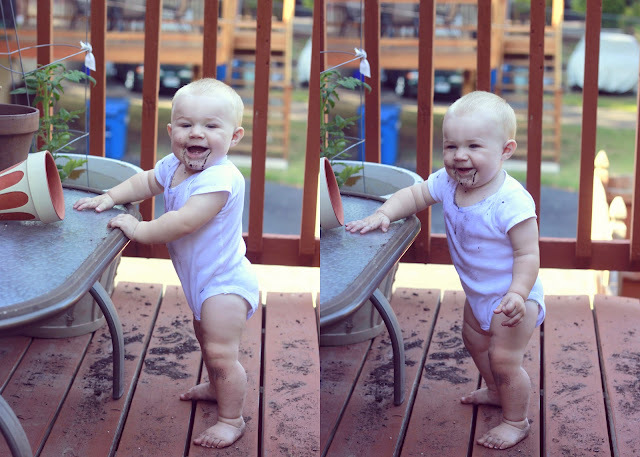 Sebastian's dirt beard is pure cuteness. ohhh...i think i just romited (reader+vomited). and then "aww"d at that pic of sebastian. so many conflicting emotions in one post! sorry - that's not spam ... that's my son following suit, years back! (the dirt! not the puke! ha) I think you'll be able to use the link. I'm SO not looking forward to potty training. You have a ton of sympathy coming your way from LA. just what i needed for a little shot in the arm after dangling a naked, squirming and grunting poop-feigner over the toilet, only to be rewarded 6 minutes later with streaks in the bathtub. Screw it, diapers go up to size 6 for a reason. Basher kinda looks like he's rocking a goatee. I approve. Have you ever seem the cover of V for Vendetta?